October 2 is Maryland’s Customer Service Appreciation Day. The Maryland Energy Administration is proud to provide State residents with information and assistance on ways to evolve their energy use via renewable energy options or via energy efficiency practices. In fiscal year 2018, the Maryland Energy Administration is proud to share that 97.5% of survey respondents indicated that they were either “Very Satisfied” or “Somewhat Satisfied” with the customer service provided by Maryland Energy Administration staff. The full 2018 Customer Service Annual Report is available now on our website. 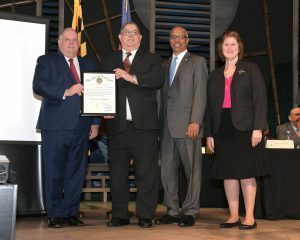 The Maryland Energy Administration is fortunate to have a staff with diverse professional backgrounds and unique talents that make us well equipped to serve local residents, businesses, nonprofits and government organizations. One way our agency works to maintain our positive level of customer service is via internal team recognition through our gold star, employee of the month, quarter and year programs. Recently, one of our Program Managers received a Governor’s Citation for their dedication and service. After a lengthy and distinguished 30 year career serving his country in the United States Navy, Captain David Comis (USNA ’77) Retired, joined the Maryland Energy Administration as the agency’s solar energy program manager. David also serves as a subject matter expert on nuclear power, battery storage and microgrid initiatives. In his role, David manages the Clean Energy Grant program as well as programs involving Solar, Nuclear and Battery Storage. David recently launched several programs to support the State of Maryland’s new Community Solar Pilot Program. David frequently interacts with Maryland residents interested in installing solar technology, as well as helping contractors and businesses working to deploy solar technology across our State. David is a major asset to the State, the Maryland Energy Administration and is committed to helping achieve the goals of his agency by promoting affordable, reliable, and clean energy for the benefit of all State residents. Moving into fiscal year 2019, the Maryland Energy Administration aims to continue to maintain the high rate of overall customer satisfaction. To do so, our staff will actively seek new opportunities to improve the overall customer service experience of Marylanders. Do you have a suggestion for us? Please contact us at DLinfo_MEA@maryland.gov or if you are looking for information on a specific energy Program, you can contact the individual Program Managers here and read their bios here. Thank you for allowing us to serve you.